This article explains how NY schools are required to hire from a pool of senior teachers who must be paid more than entry level teachers. In effect, schools are required to pay more than the market clearing wage. The result: teachers are unemployed and classes go without teachers. In other words, reporting income to the IRS would not only increase what you pay in federal income tax, and increase how much you pay on your mortgage, and increase how much you pay on your student loan, and increase how much you pay in state income tax, but also increase what you pay for health care. Does Aid to States Stimulate the Economy, or Votes? About one-third of the aid in the “stimulus” law is aimed at state and local governments. 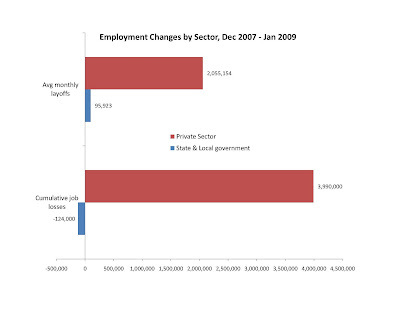 This allocation — largely intended to save the jobs of government employees, among other goals like providing more services for struggling families — vastly overstates the importance of state and local government in the national employment picture, and thereby diminishes the law’s potency as a stimulus to national employment. If, as some of the experts say, it were the task of federal fiscal policy to put people back to work, you would think that stimulus spending would be allocated to the various sectors in rough proportion to the jobs that were lost, or might be lost. Before this recession started, state and local government employment was only 14 percent of national employment and a lesser percentage of national payroll spending — far less than the one-third of the importance it was given in the stimulus law. State and local governments are seeing declines in their revenues from income, sales and other taxes. Some of those governments have cut hours or the number of workdays for their employees. But lots of industries are seeing their revenues decline, and have reduced working hours, so these changes do not put state and local governments in a special position. Although stimulus advocates insist that saving state and local government is the secret to an effective stimulus law, economists have known for a long time that state and local government employment is more stable than private-sector employment, even without special stimulus aid. In the average month, over two million private-sector employees were let go, as compared to 96,000 state and local government employees. Of course, that was bad news for 96,000 families of state and local government employees, but I see no economic reason why their suffering would count 20 times as much as the suffering resulting from the private-sector layoffs. For these reasons, an effective stimulus law would have allocated state and local government something from 4 percent (its share of layoffs) to 14 percent (its share of employment) of its funds. Economic analysis does not support the extraordinary importance afforded state and local governments by the stimulus law, but political analysis might. In particular, patronage jobs are an important part of the political participation machine. Perhaps when members of Congress were talking about “saving jobs” as they authored the stimulus law, they were talking about 535 specific jobs — their own! [Added: Professor Tollison writes "[This] is called buying votes with the public purse. See Gavin Wright on New Deal spending and electoral votes, REStat, 1970's. Then, regress swing states in the last election on stimulus money to date." Where are Housing Prices Headed from Here? Real housing prices may come down somewhat, but not significantly below their lows this spring. 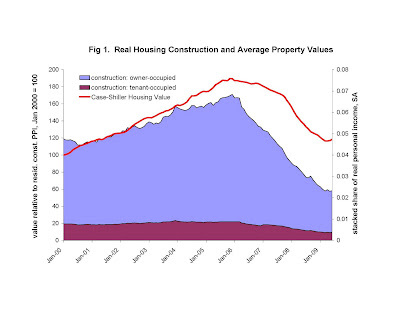 My reasoning: housing construction cannot go below its lows of this spring, because that would create, and then intensify, a housing shortage. Children are still being born, immigrants are still moving to America, and (many) teenagers still aspire to get out of their parents' house. That is, demand will continue to grow, and somebody has to build the houses to satisfy demand. Of course, construction businesses do not care about surplus/shortage per se: they want to make money. The way that the market ensures that housing construction will continue is by having a housing price that stays at or above the cost of construction. Construction businesses respond by making more houses. Note I do NOT claim that real housing prices will necessarily rise (more details on "The anatomy of a housing recovery"). They could rise -- perhaps significantly for a while (that depends on the reasons for the housing cycle in the first place, on which I'll write more later) -- but ultimately they'll be about where they are now. Moreover, I am confident that NEITHER real housing prices nor the pace of housing construction will return to their previous highs any time in the next five years. Simply put, my definition of a "housing recovery" is not a huge increase in real housing prices (more details on "The anatomy of a housing recovery"). Of course, (absent a deflation) my definition of a housing recovery does mean that nominal housing prices will trend up. If real housing prices fall significantly below their lows of this spring, or the pace of housing construction fails to pick up, then we have evidence I have missed something critical. Maybe demand turns out to be stagnant for a number of years. Maybe banks stop making loans. But I am skeptical that these forces will be powerful enough to overwhelm the basic supply and demand forces I have outlined. In contrast, Professors Shiller and Krugman have been saying that nominal housing prices are likely to get significantly lower. Absent a deflation, it follows that they think real houses prices will fall even more than that. 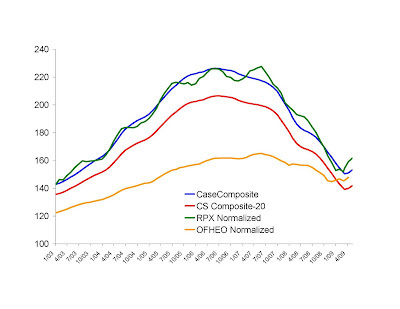 Someone emailed me that housing prices indices are plagued by "composition bias": the indices move up and down because the types of houses included in them change, and not because the price of any one of those houses actually moved in the direction of the index. Specifically, he suggested that housing prices might not have increased in the last month or two. I agree that composition bias needs to be considered, and admire Professors Case and Shiller for the hard work they've done on this measurement problem (and appreciate the email -- I would like to thank the author by name but he asked to be anonymous). It is likely that housing price indices will show some downward wiggles merely due to composition bias. However, if today we are at the point that composition biases, rather than a CRASH (a genuine and significant surplus of houses), are driving the price measures, then I rest my case: the crash is over, or at least so diminished that we cannot distinguish it from technical issues that may be boring, but sometimes demand attention from those of us doing quantitative work. This guy was standing on land 20 feet above the ocean and a huge wave pulled him in ... so the Coast Guard cutter fought some pretty big waves to rescue him. Has anyone seen a cost-benefit analysis of the Coast Guard? I'm a big fan (their blog and drudgereport are the only non-economics blogs I follow): probably means that I am better off not seeing one. Professor Shiller himself (with the ideas of supply and demand conspicuously absent from his analysis) said in June that housing price declines "may well continue for some time." Housing price data released today seem to further contradict his prediction. When he said that, he had six months more data than I did in December when I said (based on supply and demand) that housing would turn around "summer 2009." The chart below shows his index as a ratio to construction prices, together with the volume of construction activity (I am not sure about the most recent month's breakdown between tenant and owner occupied ... still working on that). I'll let you decide whether (as of June), the housing market was still in free fall. 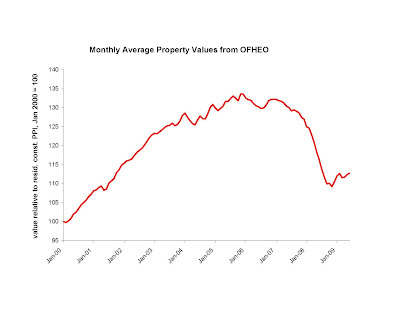 This next chart shows the OFHEO housing price index through June: it showed a turn-around even earlier than Case-Shiller did and continues to confirm that view. This next chart is from Sean MacLeod (thank you sir! he sent it before the June OFHEO was released), comparing 4 different indices. When I turn back to revising my paper about housing prices and construction, I will learn about the RPX index, but for now all I know is that Sean MacLeod makes a good case that it should be considered. 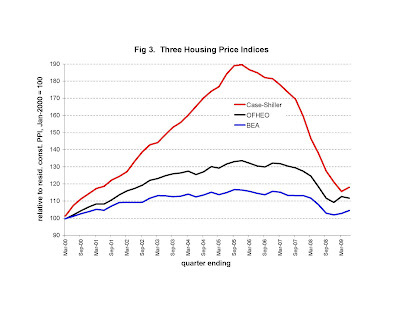 Finally, the BEA has a quarterly index of the price of new "residential structures" (that is, housing!). 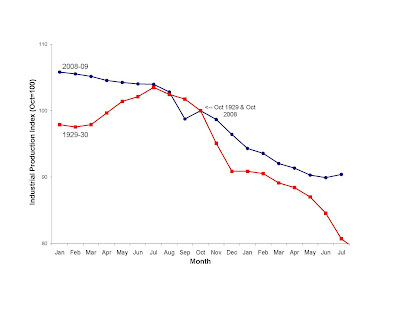 The chart below shows that index together with quarterly averages of C-S and OFHEO through 2009 Q2. We have been told that unemployment insurance (and other means-tested benefits, to which I collectively refer as "UI") stimulates the economy because it redistributes from savers to consumers, and that consumption has a multiplier. For the sake of this discussion, I will ACCEPT the (dubious) proposition that consumption has a multiplier: an exogenous increase in the consumption spending by one group will create jobs and ultimately increase the consumption spending of others. This proposition does NOT imply that government spending on UI has a multipler, because UI likely LOWERS aggregate consumption. The so-called multiplier only tells us the amount of the consumption impact, not the direction. If UI lowers consumption, and the multplier is large, then UI lowers consumption by a lot. WHAT IS THE **DIRECTION** OF UI'S EFFECT ON CONSUMPTION? The "Keynesian" view is that essentially ALL persons unemployed are unemployed through no action of their own. All UI does is raise their consumption. Keynesians will admit that the taxpayers/government-debt-purchasers who finance UI will consume less as a result of UI, but they say that the marginal propensity to consume is greater for the unemployed than for the persons who pay for UI. For the sake of argument, I will accept their proposition that the two groups have different marginal propensities to consume, and denote those propensities as U and E (with 1 > U > E > 0). I also agree that many people would be unemployed even without UI, but "essentially all" is an exaggeration. UI makes it easier to be without a job, and there must be SOME people who are unemployed because of UI. Let G denote the ratio of genuinely unemployed (the ones characterized by Keynesians) to this second group. All I am saying is that G << infinity. Let dR << 1 denote the impact of UI on the funds accessible to unemployed persons (that is, funds available under UI minus funds accessible from friends, family, etc., in the absence of UI), expressed as a ratio to the productivity of persons on the margin of employment. If all unemployed were "genuine," then the consumption impact would be (U-E)dR when expressed as a ratio to the productivity of persons on the margin of employment. If all unemployed were in that state because of the incentives presented to them by UI, then the output impact would be -1 when expressed as a ratio to the productivity of persons on the margin of employment, because the decision not to work means that output is destroyed. The consumption impact in this case is -A, where A the effect of aggregate output on consumption (you could think of it as an average of U and E). Notice that (a) the first term includes the GAP between two marginal propensities to consume, whereas the second term includes the LEVEL and (b) dR << 1 appears only in the first term. Thus, if you think the net consumption impact is positive, it is not enough to say that G > 1 (genuine unemployment is more common), you need a G of something like 10. Succinctly put, any positive consumption impact of UI comes from DIFFERENCES in spending patterns across types of persons, whereas the negative impact comes from the fact that output is destroyed when someone makes the choice not to work. The former effect is small, so it had better occur many times in order to dominate the second effect. Means-Tested Mortgage Modification: Homes Saved or Income Destroyed? Click here for an executive summary. This paper uses the theories of price discrimination and optimal taxation to investigate effects of underwater mortgages on foreclosures and the incentives to earn income, and the degree to which those effects are shaped by public policy. I find that the federal government’s means-tested mortgage modification plan creates a massive implicit tax that may be significant even from a macroeconomic perspective. An alternative of modifying mortgages to maximize lender collections would also feature means tests, but with less effort distortion and perhaps fewer foreclosures. The paper also considers the consequences of a public policy that left mortgage modification to lenders, subject to a requirement that modification would not be conditioned on borrower income. Last week, I wrote about the seasonal employment surge: Almost 700,000 more Americans reported in July that they were employed than did in May. Since then, data releases, reader comments and additional space permit further interpretation of this fact. The Census Bureau’s household survey found that, without seasonal adjustments, 141,055,000 Americans were working in July 2009, as compared to 140,363,000 who were working in May 2009. The two-month increase of 692,000 is significant, even when compared with some of the heaviest monthly job losses experienced during this recession. Most of the media attention during this recession has been rightly focused on the seasonally adjusted employment series, because those remove the annual seasonal cycle and are therefore the best series for understanding whether the recession might be over. However, the seasonal employment and spending patterns themselves are normally the outcome of supply and demand, so they are a good laboratory for detecting a sudden change in the role of supply in determining employment outcomes. Last week I explained how the supply of labor is an important factor every summer, and the summer of 2009 has been no exception: The end of the academic year makes more students willing and available to work, and the market finds work for them to do. A lot of commentary has been quick to link employment to spending in the economy, and has given little attention to the supply of labor. However, late last week we learned that the volume of retail sales (not adjusted for seasonality) was actually lower in July than in May, and that the dollar amount of retail sales was essentially constant. One reader inquired whether labor supply, while still relevant even in the depths of this recession, might be less important than in the past. I expect that there is something to this reader’s idea, because the minimum wage has increased three years in a row and is expected to create an excess supply of workers (especially among teenagers, and especially this year when the real minimum wage had already gotten pretty high even before July’s increase went into effect). 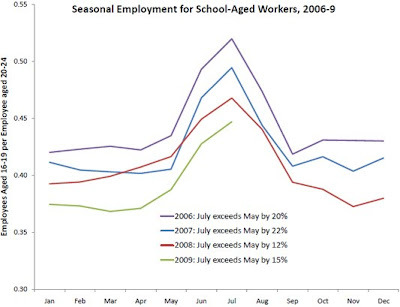 The chart below investigates this idea by comparing the seasonal employment cycle across years. Each series is the ratio of teenage employment to the employment of those 20 to 24. The teenage group is the most affected by the academic year because they have so many more members in school. The 20-to-24 age group is used as a benchmark to reflect the general decline in employment, and its possibly specific effects on the types of jobs that would disproportionately employ young people. The summer of 2009 is the depth of this recession, whereas the recession was still pretty mild in the summer of 2008. The years 2006 and 2007 are before the recession, and the year 2006 before any minimum wage increase. All four of the years – including 2009 – show a teenage employment spike in July. 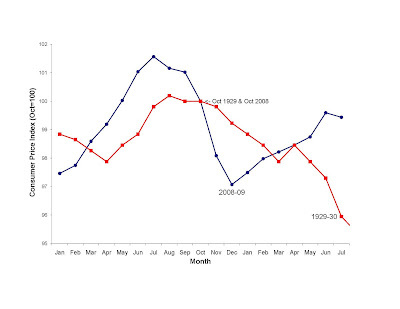 In fact, the July 2009 spike is about the same size – 15 percent (relative to the previous May) – as the 18 percent average of the prior three years. It is true that a spike of 15 is less than a spike of 18, and this is consistent with the claim that the role of supply is slightly less important than it was before the recession. But the seasonal cycle clearly shows that labor supply remains important, and cannot be written off when looking at today’s job market fluctuations. Unfortunately, demand-oriented public policy has done much during this recession to discourage the supply of labor, and little to encourage it. Video version here, from CNBC's Kudlow program. The White house has released estimates of the fiscal stimulus' impact on the economy through June 2009. At best, those estimates show that the fiscal stimulus has been a colossal waste of tax dollars. The White House claims that growth rates are persistent: the negative real GDP growth prior to 2009 Q2 would have continued indefinitely if it were not for wise fiscal policy. That claim is ridiculous, and inconsistent with the rest of their calculations, but I will put that to the side until later this week. Another future topic is the private consumption impact of all of this, conspicuously absent from the Administration's analysis. In fact, 436,000 jobs per month were lost (p. 9), so we have to thank the White House for the 161,000 per month that were not lost. That puts April, May, and June employment 161,000, 322,000, and 483,000 higher than it would have been without stimulus, or 966,000 job months. That's 80,500 job-years. The same logic for real GDP: it would have fallen at a -3.3 percent annual rate (p. 12), but in fact it fell at a -1 percent (p. 12) annual rate, so we have to thank the WH for the -2.3 percent further negative annualized growth rate that would have occured without them. So, from the jobs perspective, we just spent $100 billion of taxpayer money (not counting the economic damage done to raise this money) to supposedly create 80,500 job-years: that's $1.2 MILLION per supposed job-year!! Can we agree that creating a job for a year is wonderful, but not worth $1.2 million?! From the GDP perspective, we just spent $100 billion of taxpayer money (not counting the economic damage done to raise this money) to supposedly raise GDP by $20.3 billion. That's the kind of public sector productivity we've come to expect! NEXT: let's look at consumption, and unpack the "supernatural spiral of spending" that stimulus advocates would have us believe. Some of the headlines today were "housing starts down 1 percent in July." But housing starts are still higher than they have been for almost a year. 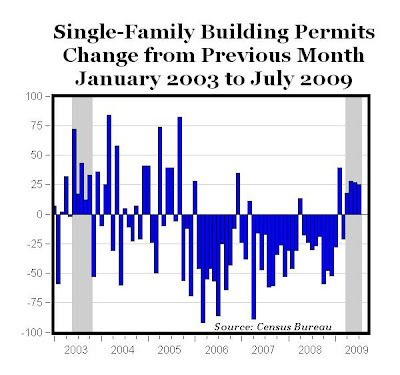 Moreover, apartment/condo buildings probably react with a lag (these projects take a while to stop, so their inventory build up more), so if we look at single-family housing starts, those were up in July, as they have been for several months. I was a happy resident of Seneca, SC for a short time. Current resident Professor Matt Lindsey describes some stimulus impact there; the good people of Seneca deserve better. "It has taken a while, but the stimulus package has reached [Seneca]. Over the last weekend Walnut Street was resurfaced and widened with a center lane for turning (into???). The important aspect is the widening which was undertaken with such zeal that the sidewalks had to be moved and repaved leaving the power line poles in the middle of the outside lanes. It is this latter aspect that provides the much vaunted multiplier effect of the spending. Now the power company will have to come move the poles out of harms way. Very soon, too, because it is only a matter of time before someone takes the outside lane and mows down one or two poles. More multiplication of stimulus effects will result when the state has to come back and resurface the holes left by the pole movement. This Obama team is full of clever tricks!" It is easy to forget that "GDP" stands for "Domestic product, GROSS of depreciation." Thus, one shortcoming of GDP as a measure of economic value is that measured GDP can go up merely because the government pays workers to destroy something (or render it less useful, like those sidewalks and telephone poles in Seneca). The destruction is not subtracted, but every dollar of the government salaries are counted in GDP (regardless of whether anyone ever turns left in that new left turn lane!). You might hope that NDP (net domestic product) would correct for this, but it does not. NDP does subtract depreciation, but only anticipated depreciation (with an occassional exception when there is mass destruction like a hurricane). Thus, those telephone poles and sidewalks in Seneca are assumed to depreciate at a fixed rate regardless of whether the government actually destroys them or makes them less useful. The national GDP accounts are a wonderful tool and are thoughtfully and diligently maintained by the Bureau of Economic Analysis. But sometimes they need some tweaking, and can potentially be exploited by those who would like to exaggerate the value of public spending. Tomorow's topic will be "should there be a second stimulus?" The Las Vegas Sun offers a summary of two very interesting studies. Industrial Production: Look at That! 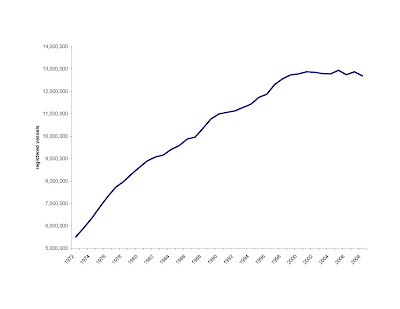 Industrial Production finally went up (see the chart below). Relative to the trend, that's a good sized increase. Capacity utilization (not shown) also went up. Today we learned that the NSA (SA) CPI was down (up) a little in July, but still higher than it was in any month Nov - May. On the Kudlow Report, 7pm Eastern time (our part is not until 740p). Topic: should there be a second stimulus? Due to last Monday's appearance, my element of surprise is largely gone. Commenters: What do you think former Secretary Reich will say, now that he saw me on Monday? 12/08/08: I wrote that housing would begin to recover in the "summer of 2009" (that's now!). I reiterated that forecast in April, with some discussion of how low real incomes might back that date up, but still sticking with summer 2009 as a likely possibility. 07/18/09: Professor Krugman writes "Housing Won't Recover Until At Least 2011"
Even though Professor Krugman had 7+ months more additional data to use for his forecast, I still think his forecast is wrong (and mine is the reliable one) because Professor Krugman has not indicated that he has made any consideration of supply or demand. So let's revisit this disagreement in six months. The Coast Guard measures the number of recreational vessels that are registered in one of the fifty states. Pretty much any vessel with a motor OR over 16 feet long has to be registered. Below is the time series. Why did the increase stop circa 2000? Was Bush anti-boater?! Can President Obama turn this trend?! If you have an idea, let's collect the comments here (on the Sports Economist blog). Has Anyone Backed out the Multiplier from This? The White house has estimates of the fiscal stimulus' impact on the economy through June 2009. Given that so little had been spent through June, I assume that their estimates imply that the multiplier is 20 or 50 or something like that. Any multiplier bigger than 3 is not credible by anyone's standards, so any finding of a larger multiplier proves that the economy is recovering for other reasons. Does anyone have the multiplier estimate implied by White House's estimates? [Added: the white house seems to now be using the change in growth rates ... that is, attributing to the stimulus all of the difference between the Q1-Q2 growth rate and the Q4-Q1 growth rate. Supposing that's true -- that $60 billion worth of stimulus caused a permanent increase in the growth rate (or even an increase in the growth rate that lasts a year) -- doesn't that imply a huge multiplier? I don't see that any blogs have yet made the internally consistent calculation]. Watch this one, and cast your vote. even wasteful spending is helpful. How can that be? I have said pretty clearly that unemployment benefits are nice for the unemployed. I won't argue with anyone who says just that. claims that unemployment benefits do little or nothing to raise unemployment (reduce employment). Those claims are not based on economics. claims that unemployment benefits are good for people who are EMPLOYED. This is the "trickle down fraud" I referenced on Kudlow. characterizes the incentives created by today's fiscal policy as merely those of a "few hundred dollars a week of UI." Today we are talking about tens of thousands of loan foregiveness, not to mention a host of other bad incentives. If UI, narrowly defined, were the only bad incentive, you wouldn't be hearing from me on this issue. Defenders of current fiscal policy have no reply based in economic analysis, so the best they can do is claim that I say something else (eg., that I claim that unemployment benefits are themselves a fraud). On Friday, the Bureau of Labor Statistics released a report of yet another month of job losses. But underneath the national, seasonally adjusted totals is a seasonal employment rise that contradicts much of what’s been claimed about our labor market. To my amazement, the laws of economics have been suspended in economic commentary during this recession, especially among advocates of active government intervention. In particular, it has been repeatedly claimed that the supply of labor — the willingness of workers to work — is completely irrelevant for determining the total amount of employment in today’s economy. All that matters, so they say, is the demand for labor, and that demand is scarce. Paul Krugman wrote on his blog this week how he thought it ludicrous that any part of this recession’s employment decline derived from people’s willingness (or unwillingness) to work. Economist.com agreed. This viewpoint is empirically testable, because at least one thing proceeded as normal this recession: School let out for the summer. As usual, students are more willing and available to work during their summer break than they are during the school year. If it were true that willingness and availability for work were irrelevant for the number of people actually employed, then we should see little or no effect of summer break on the amount of employment (as measured by the number of people who tell the government they are working). Students on summer vacation and newly minted graduates should be entering the work force in the hopes of getting a job, but since the job market is so tough (especially on young people), employment across America should not actually go up. The government data released on Friday contradict this view. Obviously, the 16-to-19 age group has more members in school during the academic year than does wider population of adults. Thus, a decomposition of total employment by age helps us see what happened to employment as a result of the ending of the academic year. The chart below displays seasonally unadjusted monthly employment for those 16 to 19, and all ages 16 and over, minus the number employed in the group in May 2009. 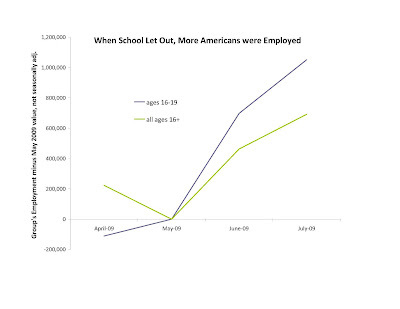 When school let out, employment surged among the school-age groups: More than a million persons 16 to 19 said they were employed in July than employed in May. Most of the media attention since Friday has been rightly focused on the seasonally adjusted employment series, because those remove the annual seasonal cycle and are therefore the best series for understanding whether the recession might be over. However, the seasonal employment patterns themselves are normally the outcome of supply and demand, so they are a good laboratory for detecting a sudden change in the role of supply in determining employment outcomes. If demand were the only thing that mattered, it would still be possible for employment to surge among those of school age, if the eager students were just “taking jobs” from older people. But the chart shows that the school-age employment surge was not fully offset by an employment drop by others, because total employment also increased as school let out. Students became available to work, and the market found work for them to do. Some may argue that summer itself is entirely a demand phenomenon: That spending surged this summer, akin to surges in summers past, and that created new jobs. But so far the data show no summer 2009 surge in spending, or in wages. Seasonally unadjusted retail sales and hourly wages both fell more than 1 percent between May and June 2009 (the latest month available). Thus, the national employment rate does depend on how many people are willing and available to work, and not solely on employer demand. Employment is higher when more people are willing and available to work even in the depths of recession. The basic economic result that both supply and demand determine market outcomes has tremendous policy relevance. It is part of the case against protectionism. It helps explain why the federal government needs to roll back some of the terrible incentives it has created, such as the marginal income tax rates in excess of 100 percent embedded in President Bush’s and President Obama’s means-tested mortgage modification programs (that is, tests that evaluate things like a family’s income, net worth and debts to determine if the family is eligible to have its mortgage modified). To be clear, much of the unemployment rate spike and the employment collapse do not result from bad policies initiated during this recession. Demand is relevant too. For example, the housing collapse would put a lot of construction employees out of work regardless of what the government did. But public policy has made those bad employment numbers even worse, because supply also matters, and cannot be ignored. Fiscal Policy made the recession worse. Stay tuned for another on-line video debate coming out later this week. Below are my posts on the fiscal stimulus. To see my posts on other economics subjects, please click on "all posts" above. I also blog weekly at the New York Times www (one of my favorites is here). "The article has 2005 dollars to make the recession look little." That's incorrect, I used the same dollars to measure the recession as I used to measure the stimulus bill: 2009 dollars. "The recession should be measured relative to an upward trend." For the purpose of a cost-benefit analysis of the stimulus package, that's wrong. It should be measured relative to what real GDP path the stimulus package might achieve. I have been generous in taking that to be real GDP constant (rather than falling, as it would have even with a brilliant stimulus in place). "The stimulus package is cheap when measured per job year". The stimulus is $215,000 per job promised. Now if we took the people who supposedly would have gotten those jobs and asked how much sooner they were employed by the stimulus (as opposed to when they would have found a job on their own), it would be generous to the stimulus to say that it was six months. So that makes it $430,000 per job-year. And I am not counting the job-years inevitably lost by the stimulus when the stimulus projects run out and their employees have to go find something else. Nor am I counting the fact the law will fall far short of the 3-4 million jobs promised -- do these things and results will look more like $1 million per job. (yes I am aware that the Obama people claim that workers getting the stimulus jobs would have remained unemployed for years without the stimulus, but that's ludicrous ... millions of people not getting employed by the stimulus will manage to find jobs more quickly than two years). If you would like to see a spreadsheet with my calculations, click here. One of New York's U.S. Senators, Kristen Gillibrand, was one of the few politicians with the courage to vote against the bank bailout (she was a Congresswoman at the time). She might like to hear that you want to stop the stimulus. Almost 90% hasn't been spent. Let's keep it that way. In February, the President signed a “fiscal stimulus law” to supposedly “create or save” millions of jobs. If executed according to plan, the bill will cost $789 billion, or about $2,600 for every American, and this does not even count the extra economic harm when our government levies the taxes to pay for it. Fortunately, almost 90% of the government spending planned by the law has not yet occurred — which means that it can, and should, be stopped. The economy has been in bad shape. Employment has fallen for a year and a half now. Real GDP has dropped four straight quarters. Many statistics show the obvious — that this recession is worse than those in recent memory. But the spending of our political leaders — including the $700 billion bank bailout and the $789 billion stimulus — is totally out of proportion, not to mention counterproductive. Over the past four quarters, real GDP has been $655 less per person than it was in 2007. That’s a lot by comparison to previous recessions, but it makes no sense to spend thousands per person to attempt to partially fix a few hundred dollar decline. Even if the Obama Administration were right that the stimulus law would “create or save” three to four million jobs, that means each job costs the Treasury $215,000! The best case scenario for the stimulus law gives us results that are miniscule compared with the costs. In the worst case scenario, we actually pay money to further harm an already struggling economy. Advocates will tell you the economy would be even worse if it weren’t for the stimulus bill. They’ll lead you to believe that every man, woman, and child is on the brink of starvation, but will survive only because government is proactively saving their employer and their jobs. Yet, since this recession began, tens of millions of Americans were hired into new, private sector jobs even before the stimulus law was signed. Over 4 million were hired in January 2009 alone. This hiring rate is less than healthy, but it contradicts stimulus advocates’ claim that only government can be our employer. Just as bad, our federal government has managed to escape the accountability that Americans deserve from its leaders. The claim that “it’s bad, but would be even worse without us” permits the Obama administration and its allies to do any amount of harm without questioning. Indeed. It would have been designed better if money had stayed with the taxpayers instead of funneling through dozens of federal agencies — an option that is still available. Otherwise, we are looking at heavy taxes — and further economic damage — down the road to pay for all the borrowing. Stimulus spending is doomed by the fact that most of our job losses are concentrated in a few sectors, and in regions of the country that had the larger housing boom and bust. Construction workers as a group lost more than 1 million jobs, especially in places like Florida, California and Nevada. The government could put close to a million people back to work by hiring them to build more houses, but then it would be rightly criticized for adding further to the excess supply of homes. Government could hire teachers and nurses — education and health are not in such excess supply — but then it would create few jobs because, while some teachers and nurses are unemployed, their numbers are far fewer than those in construction and manufacturing who were put out of work. And even if you could quickly transform former construction workers into effective teachers and nurses, that would require moving people from where many of the jobs were lost (California, Florida, etc.) to where the health care and education are needed (all over America). The stimulus won’t do this. But the free market will — people will move in pursuit of jobs, will train in new industries. Most economists think that real GDP will start growing again within a few months, if it hasn’t already. Houses are starting to sell again, and some new ones are being built. Employment will continue to fall for a while, but we learned this Friday that the job losses this summer are less than they were in the depths of the recession. State governments have seen their tax revenues drop, and some economists are concerned that they’ve become “50 little Herbert Hoovers” who raise tax rates and cut spending in order to balance their budgets. But transforming Hoovers into FDRs is not the way the stimulus bill could achieve its employment goal, because few of the job losses have been in the government sector. Even as the stimulus law was being passed, state and local government employment had been higher than it was when the recession began. Local governments, meanwhile, spend the money as impotently as the federal government does — while still considering tax increases. Just as this recession was beginning, the county board in the Chicago area voted to hike its sales tax, making it the highest in the nation. As outrage by citizens and businesses grew louder, one-time advocates on the county board changed their minds and voted to repeal the hike. Let’s hope that American taxpayers turn up the volume of their own outrage, and demonstrate to President Obama’s one-time allies that their political survival depends on stopping the stimulus. For good reasons, the establishment survey is better for measuring monthly fluctuations, and we generally prefer seasonal adjustments to none. But that preference is based on THEORIES so, unless you are 100% sure (as opposed to 99% or less sure) about the details of those theories, you should give some weight to the other series. This is BLS series id LNU02000000 "(Unadj) Employment Level, in thousands". Note that this series' employment changes from each Dec to Jan are affected by "changes in the population controls". The female employment share went past 49.8% in June. However, the "problem" is that I still don't think it can go past 50.0% in the near future without the aggregate's going below 131 million. This morning's employment data strengthens our impression that aggregate employment will stay above that. By some measures, U.S. average housing prices have fallen by a third since 2006 and some forecast them to fall further. Prices have fallen more than fifty percent in Las Vegas and Phoenix, and nearly that much in Detroit, Miami and much of California. As a result, almost 14 million homes nationwide were “underwater” in early 2009: worth less than the mortgages for which they serve as collateral. About one third of homes with mortgages in Arizona, California, Florida, and Michigan, and more than one half of homes with mortgages in Nevada, are underwater. At the same time, U.S. employment has plummeted, especially in states that had large housing price increases prior to 2006. Many factors – too many to be considered in a single paper – caused the 2008-9 recession, but the housing price cycle and its legacy of underwater mortgages is likely among them. Economic analysis readily reveals some effects of underwater mortgages on foreclosures and the incentives to earn income, and the degree to which those effects are shaped by public policy. A homeowner always has the option to stop paying his mortgage. Although state laws are somewhat different, to a good approximation the worst case scenario for a homeowner who stops paying is that he can no longer own or occupy the house, and may suffer a reduction in his credit rating that might raise his costs of future borrowing. But if the combined value of his house and these costs were less than the present value of his promised mortgage payments, then he could do better than paying in full. That’s probably an important reason why, as of early 2009, more than five million homes were already either in foreclosure or their owners were delinquent on their mortgage payments. When foreclosures are motivated by low home values rather than the quality of the match between a homeowner and his home, a foreclosure is inefficient because it requires the homeowner to live elsewhere. The anticipation of foreclosure of an under water home probably also creates moral hazard in maintaining the house, because the occupant prior to foreclosure has no stake in the home’s value. These are some of the reasons why public policy seeks to reduce foreclosures. Lenders have modified the terms of some of their mortgages or otherwise modified payments associated with mortgages in order to avoid foreclosure, both in this recession and previous recessions. However, some mortgage industry participants have complained that too few mortgage modifications occur because of the excessive transaction costs in dealing with individual homeowner situations and dealing with investors who have varied stakes in the mortgage payments. The Bush administration advocated a mortgage modification plan authored by the FDIC, which has been tweaked and further promoted by the Obama administration’s Homeowner Affordability and Stability Plan. What are the consequences for this FDIC-HASP plan for the supply of effort and the incidence of foreclosures, and how do they compare to those of a plan that maximizes lender collections, or a plan that maximizes lender collections without means-testing? All three plans reduce foreclosures as compared to leaving the mortgages unmodified. Although the unmodified-mortgage benchmark aids understanding of the economics of mortgage modification, we cannot assume that under water mortgages would go modified absent the FDIC-HASP plan and its means-tests. Rather, we might expect lenders to modify mortgages in a way that enhances their collections. As compared to the collection-maximizing benchmark, the implicit marginal tax rates FDIC-HASP plan – well over 100 percent – are excessive. Moreover, FDIC-HASP needlessly distorts the supply of effort for slightly underwater borrowers, because foreclosure rates among those borrowers would be low (if not zero) under the collection-maximizing plans. For some relatively small amounts of negative equity, FDIC-HASP may result in more foreclosures and overall deadweight costs than would a plan that maximizes collections. The collection-maximizing plan uses means tests rather than foreclosures to obtain small collections from the high income borrowers, based on the fact that (from the perspective of a lender and his borrowers) the marginal deadweight costs of mean-tests are initially zero whereas the marginal deadweight costs of foreclosures are positive. At first glance, small amounts of negative equity would seem irrelevant today because housing prices have fallen so much. However, even in Nevada where underwater mortgages are the most prevalent, “only” half of mortgages are under water, which means that half are not underwater and presumably many are only slightly underwater. The fact that recent declines in home values have coincided with increases in the fraction of U.S. mortgages underwater shows that many mortgages are slightly underwater. Thus, even if FDIC-HASP enhanced efficiency for deep underwater mortgages (it does not), the fact that it harms efficiency for the numerous slightly underwater mortgages means that its aggregate efficiency impact could well be negative. The mathematical analysis shown in my research papers has been confined to mortgages, with a basic setup in which one party (a “lender”) attempts to collect from a heterogeneous group (“borrowers”), using a threat of punishment (“foreclosure”) for nonpayment. With the housing crash and recession, the unsecured amount to be collected has suddenly increased, and the punishment may have lost some of its pain. As a result, full collections are not made, but rather forgiven for those who appear to have the least ability to pay. This basic setup probably has a lot in common with revenue collection efforts elsewhere in the economy, such as the collection of trade debts, tax debts, student loans, or tuition payments. Indeed, since I began writing on mortgage modification in the fall of 2008, the federal government began to modify student loans, with the borrowers who earn less receiving more loan forgiveness (Glater, 2009). Thus, while millions of workers have seen massive increases in their marginal tax rates during this recession as a result of mortgage modification, additional workers and businesses may also have seen significant increases in their marginal tax rates due to these other collection efforts. Federal mortgage modification programs create excessive marginal tax rates, but the use of means-tests in the mortgage modification process would occur even without government intervention because means-tests are in the collectors’ interests. Positive marginal tax rates are thereby created in the private sector, on top of the various income taxes and means-tested benefits perennially administered by federal, state, and local governments. A prior economics literature has already shown how tax rates are excessive when multiple collectors have access to the same tax base. Thus, it is ironic that the federal government has raised the implicit marginal tax rates associated with mortgage modification, when it would enhance efficiency and its own tax collections by unconditionally repudiating some of the private debts, or at least pushing private collectors to rely less on means-tests than would be in the collectors’ interest. Prohibiting means-tested mortgage modification is not the same as prohibiting modification: it’s just that mortgages would have to modified without means tests. In other words, those borrowers with significantly negative equity would be forgiven regardless of whether they were able to pay. In theory, lenders could find it optimal (given that they were not permitted to means test) to write down underwater mortgages so much that foreclosure rates would ultimately be quite low. Of course, a large and across-the-board mortgage write-down would dramatically reduce lender collections, but the objectives of efficiency and lender collections are quite different. The bottom line: the federal government is spending your tax dollars to further damage the housing and labor markets. [Added Aug 11: What do you mean "Implicit tax"? The FDIC-HASP plan reduces a borrower's mortgage payment to 31 percent of his income, regardless of how much the borrower had originally promised to pay. The less the borrower earns at the time his mortgage is modified, the less he has to pay in mortgage payments. The FDIC-HASP plan massively distorts the supply of income-earning efforts, because its mortgage modification is large and means-tested: its formula implies that an action taken by a borrower to increase his income would increase his housing payment obligation by 31 percent of the income increment. If the affordable payment (i.e., the payment that would comprise 31 percent of income) were re-evaluated monthly, this would amount to a 31 percent marginal tax rate in each month that a modification could occur: 31 cents out of every dollar the borrower earns is going to the bank. On Friday, the Bureau of Economic Analysis released its advance estimate of real G.D.P. for the second quarter of 2009. Although some say it provides some of the first evidence of the stimulus law’s efficacy, a close inspection of the results shows that the government sector’s contribution to real G.D.P. growth so far has been trivial at best. G.D.P. measures the total amount produced and spent in the nation during a particular time frame, like a year or a quarter of a year, indicating the country’s economic fitness. Real G.D.P. for the first quarter of 2009 was sharply lower than it was in 2008’s last quarter, which was itself sharply lower than the quarter before that. Thus, it came as a bit of a surprise that second-quarter real G.D.P. was not also sharply lower, but rather was pretty close to what it was in the first quarter. A closer inspection of the B.E.A.’s estimates gives no support for this claim. The chart below shows the change in the United States’ real G.D.P. from the first to the second quarter, broken into five expenditure categories: private domestic purchases, net exports, defense, federal nondefense purchases, and state and local government purchases. We were told that the stimulus law would invigorate the economy by spending on federal nondefense programs and helping state and local governments maintain and grow their public services. 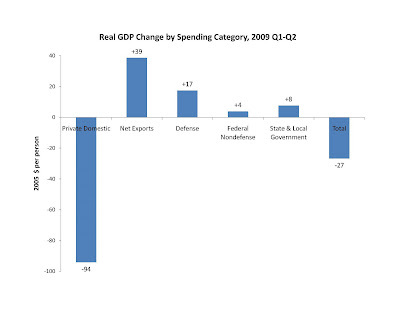 Stimulus advocates point to the fact that these spending categories indeed grew from the first to the second quarter, as shown in the chart by the fact that those two bars point upward. (Perhaps they believe that tax cuts and unemployment insurance have important effects, but these are not separate G.D.P. categories — they are included in whatever category the recipient spends them). However, the chart also shows that these types of purchases were trivial. Real federal nondefense purchases increased by a mere $4 per American, while state and local government purchases increased by a mere $8 per person. Real defense purchases increased by $17 per person, which seems large when compared to the other government purchase categories, but is trivial by any other measure. Another reason that we know that the stimulus bill had not yet delivered on its promise: employment plummeted from the first to the second quarter. We can continue to grade the stimulus law as the economy further evolves, but it finds no congratulations in the second quarter’s economic performance as measured. When an economist says that paying people to be unemployed raises the unemployment rate, laymen jump to the conclusion that economics has no compassion, and presumes that workers are fundamentally lazy. While that may be a nice debating strategy, that response is not based on logic. Yes! It is compassionate to help people who lost their jobs, by forgiving their mortgage, forgiving their student loans, giving them a partial paycheck (unemployment insurance), etc. But let's stop pretending that such policies reduce the unemployment rate. Sensible, hard working, people will understand the costs and benefits of their important decisions. Means-tested government benefits reduce the costs of being without a job. There are sensible people out there who will recognize that 2009 is not the time for them to, say, commute a long distance to work a job that's been offered to them but they do not enjoy. Sensible people will recognize that public policies have dramatically reduced the costs to them of searching further for the job they'd like, or making this the year they coach junior's baseball team, or do some work on their house, or spend time with an ailing parent, or refrain from "coming out of retirement," or take a trip. We economists do not think making choices like those have anything to do with laziness. Many times, those choices make the best out of a bad situation. Even workers who do not recognize some of the important costs and benefits at the outset may try unemployment for a while and start to notice the cushions that surround them. There may be a time and a place to be slavishly devoted to market work, but 2009 California is neither. Yes, there are also people out there who would seek employment even if that work did little or nothing to enhance their living standards. For them, a parade of employer rejections is one of the few things that would keep them from being employed. I doubt this type of person is all that numerous -- but that's beside the point. As long as there are a number of people like I described above, the bad incentives our government has created will have an impact on the aggregate data -- reducing employment and raising unemployment. To be clear, much of the unemployment rate spike and the employment collapse does NOT result from these bad public policies. For example, the housing collapse would put a lot of construction employees out of work regardless of what the government did. But public policy has made those bad employment numbers even worse. The gurus say that incentives do not matter, at least until this recession is over. "Traditionally, many economists have been leery of prolonged unemployment benefits because they can reduce the incentive to seek work. But that should not be a concern now because jobs remain so scarce, said Lawrence Katz, a labor economist at Harvard." as quoted by the New York Times. marginal federal tax rate hikes on the "rich"! According to Professor Krugman, I am the only one crazy enough to suggest that a list of bad incentives like this might actually show up in the aggregate data! Thanks readers for your hits, comments, and links to this blog! According to Palgrave, this blog is in the top 20 of economics blogs. This blog was involuntarily off-line this weekend ... maybe a "vast left wing conspiracy"! ... but officially the host Google says that it thought this might be a spam blog.